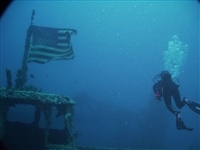 The purpose of the Advance Adventure course is to increase your diving skills and experience. This course meets once for academics and review of the materials. Students learn the basic techniques for night diving, underwater navigation, drift diving, wreck diving and deep diving. The student will complete six (6) dives: honing their skill doing the following a night dive; underwater navigation (natural and compass); drift; wreck and a deep dive (Aprox 100 ft.) Call for price.